Carrying his single-lens reflex camera, tripod and light blocker, Yang Dezhou is ready to capture the "dancing aunties" with their flying silk scarves against a blue sky in East China's Anhui province. 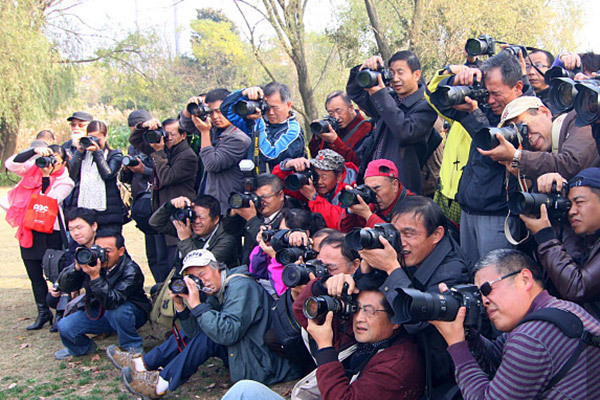 Yang, 71, is among the growing army of silver-haired photography enthusiasts in China. In 2015, the retiree decided to revive his teenage dream of being a photographer. According to data gathered from Chinese tech company Alibaba last October, one in 20 senior citizens on its shopping platforms owned a selfie stick. The elderly photographers spent 4,300 yuan ($630) per person on cameras in 2017, up 42 percent from the previous year. "Photography helps me freeze the moments and strengthen my physical fitness. It's also a sort of social activity when I go out with my friends to take pictures," Yang says, adding that the hobby is an excellent way to spend his retirement. Depending on his pension, Yang has spent almost 60,000 yuan ($8,770) on his two cameras and three lenses, let alone the costly online courses about photo editing and on photography books. Yang says photography has dug him into a bottomless hole, but adds that it is worth the price. "I made lots of friends with the same interest through the photography classes and social media platforms," Yang says, adding that they often go out to take pictures all day long. Yang joined three QQ groups and four Wechat groups of the photography classes in a community college for the elderly. There are more than 400 people in a group at most, he says.